Grab your mates, fire up the BBQ, and bring the Outback to your sausage sizzle this September! Register early to receive a special limited edition gift, a Frontier Services BBQ Welcome Kit as our way of saying thank you! If you bank more than $500 by 31st October, you’ll go in a draw to win an Outback BBQ Sauce and Rub Pack. The highest amount raised banked before 31st October will win an Outback Experience! It’s easy! Simply Register your BBQ online and invite your friends to come along! As our way of saying thank you for your commitment, we’ll send you a special Frontier Services Welcome BBQ Kit to get you started-including your personal Great Outback BBQ Apron. All funds raised go to Frontier Services programs that help Aussie farmers doing it tough. If you commit to raising $500 we’ll send you the Premium Frontier Services Luxury BBQ Kit complete with your very own insulated cooler bag with everything you need to take your Great Outback BBQ anywhere! As our way of saying thank you for supporting Frontier Services and Aussie farmers, we’ll send you one of our Frontier Services Welcome BBQ Kits equipped to help make your BBQ a success. 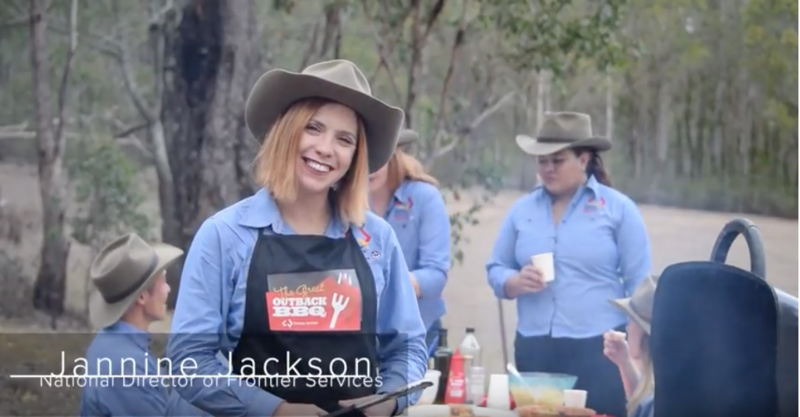 We’ve got you covered with everything from your very own Great Outback BBQ apron, themed poster, and we’ll also help you with your fundraising by sending you a Frontier Services collection box with fundraising tips and tricks along the way!